Nice simple lines, I think a little deeper F stop would have helped. Also possibility a needle stuck in the thread would add a focus point. I think a deeper DOF would help this; the string blurring at the edge of the spool distracts me from the detail that is in focus. This is a nice colorful shot even though it's only one color. It's very simple, clean, and the focus is great. Hi Elaine, I was looking through your profile when I saw you had entered the red II challenge, so I popped over to see this entry and noticed there was only one comment on it. I hate that (when I enter and get few comments). I voted this challenge, so here are my thoughts on your shot: I gave this a 6.0. It's nicely lit and the use of DoF really adds to it (I started it at a 5 and bumped it up during my review). 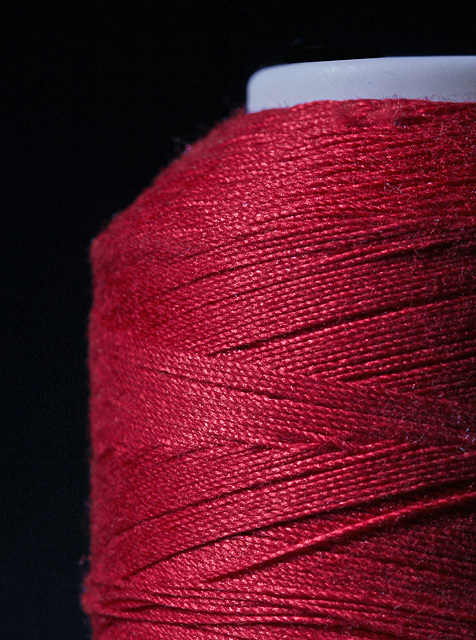 The red is a really nice choice, too (not a comment I would outside of a challenge focused on color), and the lines in the thread give some movement (top to bottom) to the image (at least to my eyes). The one problem you ran into here with me as a voter is that string is just not very interesting to me as a subject. Some people don't like kids, others don't like cats. Me, I don't like thread. Nothing you can do about that, but the technique shown on this with subject matter that interested me would have scored at least a 7, and probably higher. Like title and texture. Colour could be more lively, composition less simple. Proudly hosted by Sargasso Networks. Current Server Time: 04/18/2019 04:55:09 PM EDT.